WASHINGTON — Pakistan is the one country in the region that has done the most against terrorism, and no country can accuse Pakistan of not doing enough against terrorism and extremism, Aizaz Ahmad Chaudhry, Pakistan’s outgoing ambassador to the U.S., told VOA. “Al-Qaida, if you don’t hear about it today, it is because Pakistan and the U.S. were cooperating. Al-Qaida is the organization that caused 9/11, and therefore we think that no country can tell us that Pakistan has not done enough. In fact, Pakistan has done the most,” Chaudhry said. 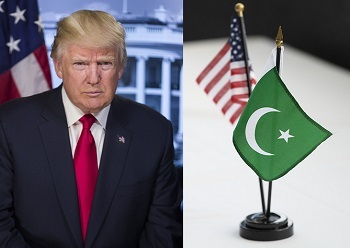 Last year, while announcing his new South Asia strategy, U.S. President Donald Trump put Pakistan on notice for failing to do more against terror safe havens in the county. The very first tweet this year from the U.S. president was about Pakistan. “The United States has foolishly given Pakistan more than 33 billion dollars in aid over the last 15 years, and they have given us nothing but lies & deceit, thinking of our leaders as fools. They give safe haven to the terrorists we hunt in Afghanistan, with little help. No more!,” Trump tweeted. But Chaudhry says the allegations that there are safe havens in Pakistan or that the leadership of the Afghan Taliban is based there are myths. However, General Joseph Votel, commander of the U.S. Central Command, told members of the Senate Armed Services Committee in February that Pakistan has yet to take any decisive action against the militants, including the Haqqani network. “Ongoing national counterterrorism efforts against anti-Pakistan militants throughout the country have not yet translated into the definitive actions we require Pakistan to take against Afghan Taliban or Haqqani leaders,” Votel said. U.S. and Afghan officials have long accused Pakistan of being selective in its campaign against militant groups operating in the country. Pakistani officials deny the charges and maintain the country has equally targeted all militant groups. “Pakistan is squeezing space on Haqqanis and the Taliban. Our message to them is very clear, ‘you’re Afghans and you should give up violence and go to Afghanistan to join the political mainstream,’” Chaudhry said. “But to hold Pakistan responsible for a lack of success in Afghanistan is not a fair treatment,” he added. Militants reportedly are using Pakistan’s tribal region for training purposes and planning attacks across the border in Afghanistan against U.S. and Afghan forces. Chaudhry asserted that following several military operations, the region has been cleared of militants. “Violence and terrorism under any pretext is not acceptable. That’s where our military forces moved into the tribal areas, especially North Waziristan where these people had created hideouts, safe havens, IED [improvised explosive devices] factories, training camps and whatever else, and two, three years later, we were able to clean up the whole place and secure every inch of that territory,” he said. Despite the government’s claim, voices raised by a recent movement initiated by ethnic Pashtuns belonging to the Tribal belt tells a different story. Pashtun Tahafuz (Protection) Movement, or PTM, charges there is no peace in the volatile tribal region. Chaudhry downplayed those accusations and seemed to suggest the PTM movement has been hijacked by outsiders. “I think people are exaggerating because they have their own axe to grind, otherwise there are talks going on with them [PTM] by the authorities and the matter is also in the courts,” he said. “Within Pakistan, Pashtuns are very committed Pakistanis, and they have made enormous contributions to the people of Pakistan,” he added. PTM members deny links to any foreign government and charge that their demands are within the country’s constitution. Islamist cleric Hafiz Saeed, a U.S.-designated terrorist, who allegedly was the mastermind of the 2008 Mumbai terror attacks that killed 160 people, is allegedly living a free life in Pakistan’s Lahore. The U.S. has criticized Pakistan for not doing enough to hold Saeed accountable. U.S. State Department spokesperson Heather Nauert said at a press briefing in February that Pakistan had been called out several times for its inadequate actions against Saeed. “How many times have we talked about the person [Saeed] who Pakistan let out of house arrest, who was responsible for the Mumbai attacks back in 2008 that killed so many people, including Americans, too?” Nauert said. Chaudhry said Saeed’s case is legal and India has failed to present evidence against him. “We tried several times in 2012, when I think the first judicial commission went, but they could not interrogate the prosecution witnesses — except then a year later they went again, but the full range of evidence was not made available that can stand the legal scrutiny,” Chaudhry said. Pakistan’s relations with the U.S. have deteriorated in recent years, and just recently, relations between the two countries plummeted to a new low when Washington issued a directive requiring Pakistani diplomats to seek permission five days in advance before traveling more than 40 kilometers outside their posts in the U.S. In retaliation, Pakistan reciprocated with its own restrictions on U.S. diplomats. Nonetheless, Chaudhry seems optimistic about relations between the two nations. “The point that I’m making is – it’s a resilient relationship and if it is passing through a bad patch today, it will come right back to normal just like it has come back in the past,” he said. Enslaved forever- is that right !